Surfers are frequently considered to be little more than slackers. For many years they’ve been stigmatized as lazy, dope-smoking layabouts who have nothing better to do than hang out on the beach all day. I’m not a surfer myself, but many of my friends are, and while they tend to have a very relaxed attitude towards life, I’ve found that as a community they’ve been unfairly stereotyped. Many of my surfer friends are involved in social issues and as people who spend many hours quite literally immersed in nature, they tend to have a very well-developed environmental consciousness. They love the sea and the creatures they share it with and hate what humanity is doing to our oceans. 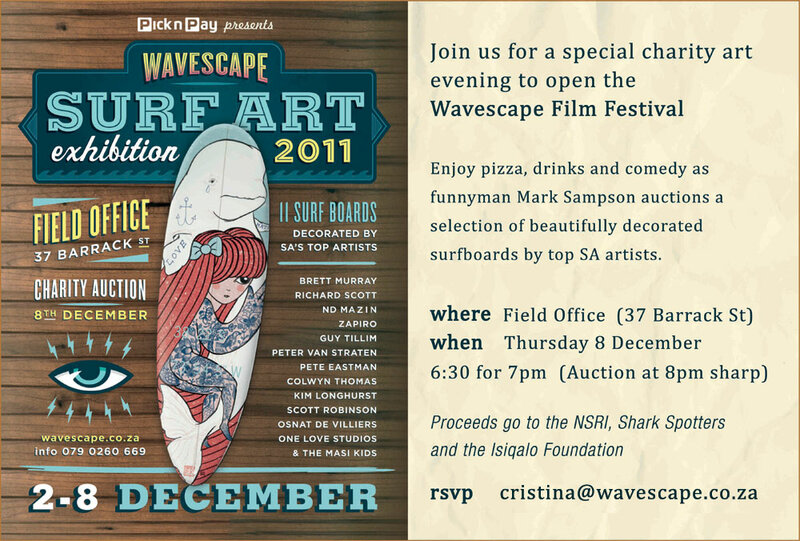 The fact that surfers really do care was once again driven home very forcefully for me last night when I attended the 7th annual surf board charity auction in Cape Town organized by Wavescape, a local surfing website. 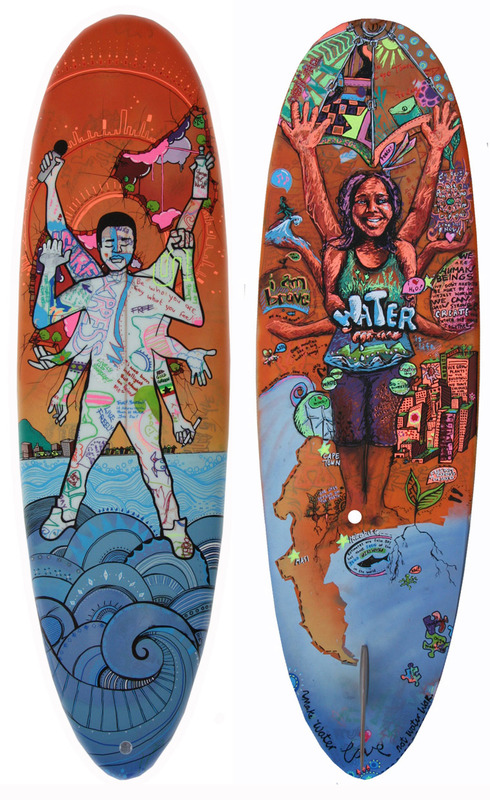 Eleven surfboards, beautifully decorated and donated by top local artists were auctioned for a record-breaking total of R221 000 (about $27 500). All of the proceeds go towards local causes dear to surfers’ hearts: the National Sea Rescue Institute, Shark Spotters, a shark safety, conservation, education and research organization, and the Isiqalo Foundation, an HIV/Aids awareness group. The board “decorated” by Cape Town performance artists and surfing activist Conn Bertish is marked by a series of ugly gashes where its fin is supposed to be. In protest against shark fining, which kills millions of sharks around the globe every year, Bertish, clad in a full wetsuit, used a panga (machete) to hack off the board’s fin in front of the Chinese consulate in Cape Town ; most of the world trade in shark fins is centerd on China. A board by renowned South African political cartoonist Zapiro went for R35 000 (more than $4000), but the evenings biggest seller and all time record-breaker was this provocative piece by Brett Murray which fetched R41 000 (more than $5000). 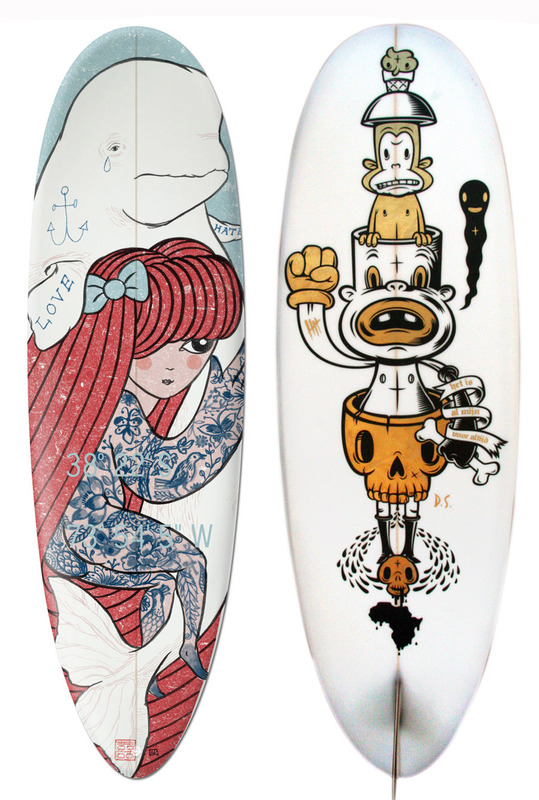 My favorite boards? This beauty by Kim Longhurst and Scott Robinson and this cartoonish masterpiece by N. D. Mazin. So as far as I’m concerned, it’s high time that we rid ourselves of the inaccurate generalisation that depicts surfers as people who’re refusing to grow up and are only interested in having fun. The fact is that many surfers care more about our planet and its people than you might have thought. Surfing is the only thing that gave me peace during the hellish years of high school. As I near my 70th birthday, I remember well the sport that taught me to trust my abilities, love the ocean, and nature. Since most of the surfers I've met fit the stereotype you mentioned, my first reaction to the "Surfer's Care" title was "About what? Jellyfish?" Now, to all real surfers, my apologies. Seems there are a lot of you out there who care about the same things I do, I just haven't had the pleasure of actually meeting you yet. There's never been a doubt in my mind, and I enjoyed this read very much. Thank you!